Mohammed, a YES student from Bangladesh, shares his story of anticipation, growth, and becoming a leader during his exchange year. When I heard that I'd been selected as a YES scholar, I knew that it was the best thing that had ever happened in my 16-year-old life. I was super excited to live in America for one year; it was my dream come true. But at the same time, I felt a lot of responsibility on my shoulders. I’d been selected to be an ambassador. I knew that every single thing I did from then on would also be a reflection on the image of my country, my religion, and my community. I knew that, while the next year would likely be the best-est year of my life, at the same time, I would have to make sure I represented my country well. Before coming on the YES program, I was a very ordinary and shy kid. I couldn’t talk to strangers; I would just stammer. I couldn’t stand on stage; my legs would shiver. I couldn’t give a presentation; my stomach would hurt. I knew I was not the best. I always had a fear that people would laugh at me. Right now, I am writing this essay sitting in my school library with my American friends. They were complete strangers to me only a few months ago, but now they are the best friends I’ve ever had in my life. I laugh at myself! I’ve changed! A lot! Only a few months ago, I was not the same ME, as I am now. Now I run to the top of the stage, and give presentations about my country in front of the whole school! I’ve even been to other cities to give presentations. My legs don’t shiver anymore, and my stomach doesn't hurt. My friends here say I am a very engaging person, but I know, I used to stammer. People still laugh at me sometimes, but now I am not afraid anymore, I laugh with them too. I’ve learned to come over my fears, in order to be my best self. In the U.S., I’ve taken leadership and public speaking classes. I’ve been involved in every single event in our school; I’ve served the community 120+ hours; and I’ve been the editor of our school newsletter. I’ve met new people and made more friends. At the same time, I’ve learned a lot about leadership. I also realized that the world needs good leaders, and that I want to be one of them. I may or may not be the president of my country in the future, but a president is not the only leadership we need. We need leaders in our families, communities, countries, and world. Before coming here, I thought I’d have a hard time in the U.S. because I follow a different religion. I was wrong. At least in my case, a lot of people were so interested in my religion, it helped me make a lot of friends. I taught them about my religion and learned about their religions, and after hours of discussions, we discovered we are very similar in our faiths. We have a lot of things in common, so we really don’t have any issues to fight for. Our personal beliefs shouldn’t be a reason for conflict; we are all humans, and this should be our reason for world peace. I believe knowing about others is the best way to get along with them. Being on an exchange program, I’ve met people from all over the world. I’ve learnt that no country is better or worse than any other. They are just different. Everybody is different. Everybody is awesome. But, in order for everybody to live an awesome life, we need to overcome our social, racial and religious issues. The world needs peace; the world needs positivity; and I am prepared to learn and to teach the world that we need to be together in order to build a better world. 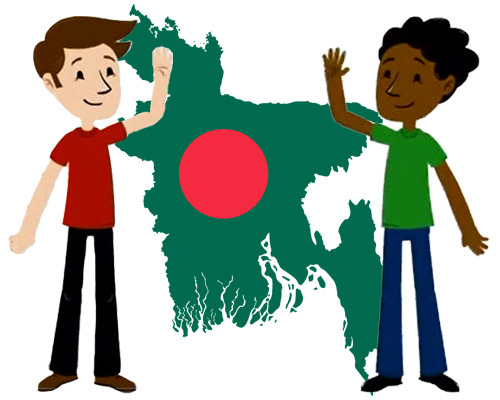 Check out this video Mohammed created to share what his friend Dominic learned about Bangladesh and what it's like to have an international friend!